Federal Communications Commission chairman Juluis Genachowski has asked the Federal Aviation Administration to consider relaxing its strict set of policies (pdf) prohibiting the in-flight use of certain portable electronics. Specifically, the FCC would like the FAA to, "enable greater use of tablets, e-readers, and other portable devices". 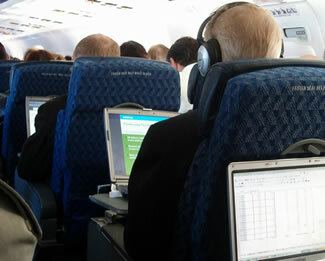 In August, the FAA announced it would be re-evaluating its existing policies regarding the usage of portable electronics during flights. Before you frequent travelers get too excited though, the FAA study is just beginning. In other words: don't expect any near-future changes to airplane regulations regarding portable electronics or PEDs. Although plans for the FAA-led study came well before the FCC's latest request, the FCC may be counting on this being an opportune time to press its influence. Currently, FAA regulations require all PEDs be stowed and powered off during takeoff and landing. Many of those devices -- like most tablets, portable MP3 and DVD players -- may be turned on once the plane reaches an altitude of 10,000 feet; however, PEDs with cellular radios are expected to remain off during the entirety of every flight. While using a cellphone in-flight is an obvious violation, devices with cellular connectivity have certainly grown in numbers over the years. We now have tablets, e-book readers and swanky Ultrabooks equipped with WWAN hardware. But let's be honest here: how many of you actually power down your smartphone during a flight as opposed to enabling "Airplane Mode" (or something analogous)? Unofficially, Airplane Mode seems acceptable, but actual regulations don't explicitly acknowledge such a mode, making it a sort of unspoken exception. Despite recent interest PED policies, neither the FAA nor the FCC seem interested in allowing voice communications on airplanes. In August, the FAA stated that its newest policy review will not even consider voice calls in the air. Meanwhile, snippets from the FCC's letter seem to ignore mentioning cellphones and smartphones explicitly. This is probably for the best, though -- imagine being trapped on a plane for four hours in a seat adjacent to a vociferous serial phone yapper.